DIE Martis, 22 die Octobris. Peers not to be attached by the Court of Chancery. Peer out of the Realm, Proxy. Epus. St. Asaph. Sir Orlando Bridgman, Mil. et Bar. Ds. Custos Magni Sigilli. Robertus Comes Lyndsey, Magnus Camerarius Angliæ. Hodie 2a vice lecta est Billa, "An Act to enable Trustees to make Leases, for Payment of the Debts, and providing for the Children, of Sir Charles Stanley." Vicecomes Say et Seale. Epus. Winton. The Earl of Dorsett reported, "That the Committee for Privileges have considered of the Matter referred to them, Whether a Peer of this Kingdom may be imprisoned by Attachment out of the Court of Chancery; and their Lordships find a Report in the Journal of this House, made the 10th Day of February, 1628, concerning that Business; which their Lordships think fit to be confirmed by this House, leaving out the Proviso therein." 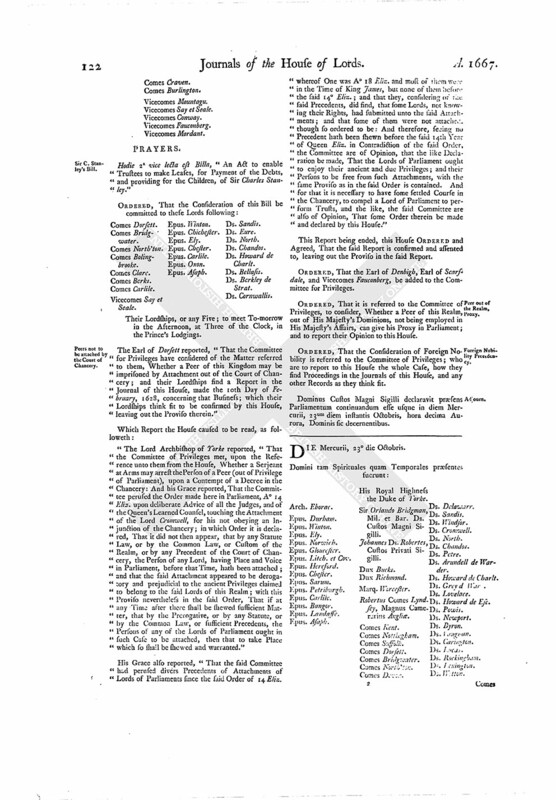 "The Lord Archbishop of Yorke reported, "That the Committee of Privileges met, upon the Reference unto them from the House, Whether a Serjeant at Arms may arrest the Person of a Peer (out of Privilege of Parliament), upon a Contempt of a Decree in the Chancery: And his Grace reported, That the Committee perused the Order made here in Parliament, A° 14 Eliz. upon deliberate Advice of all the Judges, and of the Queen's Learned Counsel, touching the Attachment of the Lord Cromwell, for his not obeying an Injunction of the Chancery; in which Order it is declared, That it did not then appear, that by any Statute Law, or by the Common Law, or Custom of the Realm, or by any Precedent of the Court of Chancery, the Person of any Lord, having Place and Voice in Parliament, before that Time, hath been attached; and that the said Attachment appeared to be derogatory and prejudicial to the ancient Privileges claimed to belong to the said Lords of this Realm; with this Proviso nevertheless in the said Order, That if at any Time after there shall be shewed sufficient Matter, that by the Prerogative, or by any Statute, or by the Common Law, or sufficient Precedents, the Persons of any of the Lords of Parliament ought in such Case to be attached, then that to take Place which so shall be shewed and warranted." His Grace also reported, "That the said Committee had perused divers Precedents of Attachments of Lords of Parliaments since the said Order of 14 Eliz. whereof One was A° 18 Eliz. and most of them were in the Time of King James, but none of them before the said 14° Eliz. ; and that they, considering of the said Precedents, did find, that some Lords, not knowing their Rights, had submitted unto the said Attachments; and that some of them were not attached, though so ordered to be: And therefore, seeing no Precedent hath been shewn before the said 14th Year of Queen Eliz. in Contradiction of the said Order, the Committee are of Opinion, that the like Declaration be made, That the Lords of Parliament ought to enjoy their ancient and due Privileges; and their Persons to be free from such Attachments, with the same Proviso as in the said Order is contained. And for that it is necessary to have some settled Course in the Chancery, to compel a Lord of Parliament to perform Trusts, and the like, the said Committee are also of Opinion, That some Order therein be made and declared by this House." This Report being ended, this House ORDERED and Agreed, That the said Report is confirmed and assented to, leaving out the Proviso in the said Report. 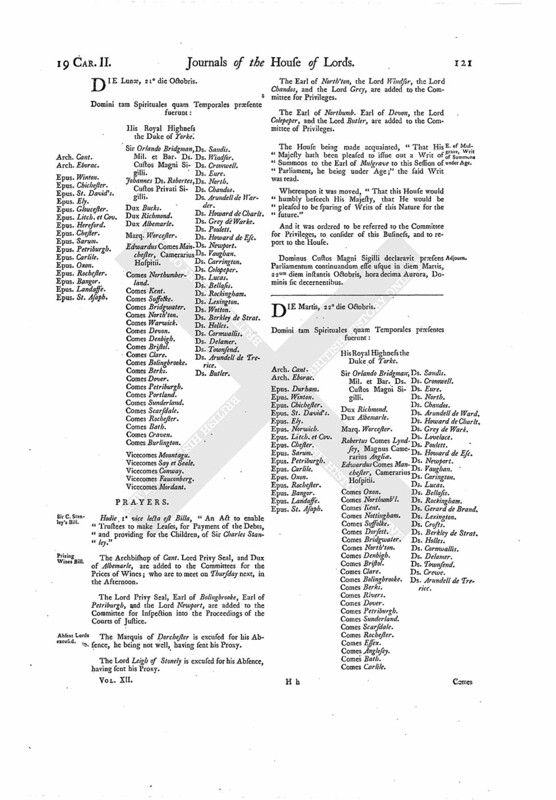 ORDERED, That the Earl of Denbigh, Earl of Scarsdale, and Vicecomes Fauconberg, be added to the Committee for Privileges. ORDERED, That it is referred to the Committee of Privileges, to consider, Whether a Peer of this Realm, out of His Majesty's Dominions, not being employed in His Majesty's Affairs, can give his Proxy in Parliament; and to report their Opinion to this House. ORDERED, That the Consideration of Foreign Nobility is referred to the Committee of Privileges; who are to report to this House the whole Case, how they find Proceedings in the Journals of this House, and any other Records as they think fit. Dominus Custos Magni Sigilli declaravit præsens Parliamentum continuandum esse usque in diem Mercurii, 23um diem instantis Octobris, hora decima Aurora, Dominis sic decernentibus.